Bush craft days and Bushcraft courses are being hailed as coming top in their field by our customers with regard to the standard of bush craft equipment and price. You can choose from a basic 3 hour session, one day bush-craft course, a two day one night option or a three day two night option. Longer trips can be arranged, please contact us for details. A basic itinerary can be found below. Our wilderness camping and bush-craft expeditions and trips are aimed at taking groups of adults or young people away from their natural environment. We will provide you with all the equipment and skills to spend time out in the countryside. This means that you don't need to buy anything to take part. 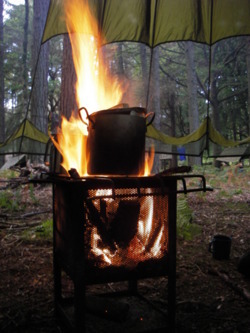 If you have some of your own bushcraft kit you are welcome to bring it along. , although you or your group will need to work closely as a team to enable you to enjoy a comfortable night under the stars. wilderness trips and bushcraft events are ideal for educational school trips, schools expeditions, youth group activities, corporate team building or stag and hen parties. To view some of our wilderness camp images click here wilderness camp.